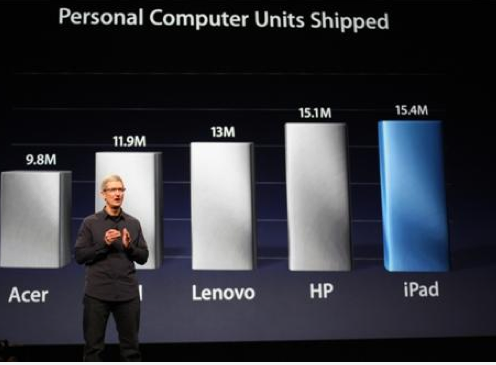 At today’s iPad 3 announcement, Apple CEO Tim Cook unveiled a staggering data point, revealing that Apple sold more iPads in Q4 2011 than any individual PC manufacturer sold of their PC devices in the same quarter. According to a slide (posted below), Apple sold 15.4 million iPads in Q4, whereas HP sold 15.1 million PCs in the same timeframe. Lenovo sold 13.1 million units in Q4. Basically Apple sold more iPads in Q4 of last year, than any PC manufacturer sold of their products worldwide.